Nobody loves me like you do Jesus! Dear Lord God, Abba Father, Jesus my Savior, deep faith roots are what I desperately need right now. 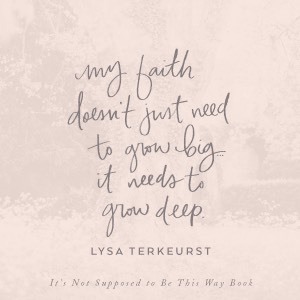 Help me take steps each day that will deepen my roots — especially when I’m having to trust You in the midst of vulnerable places. When the unexpected happens … when the winds of change blow … when the fiercest storms try to uproot me … I want to be found trusting in You. In Jesus’ Name, Amen. I’m learning to not be so afraid of what might be around the next corner. Even if it does catch me off guard. I close my eyes and whisper to the Lord … deeper still. This entry was posted on October 16, 2018 at 6:52 am and is filed under One Walk. You can follow any responses to this entry through the RSS 2.0 feed. You can leave a response, or trackback from your own site.